BOYNE CITY, Mich.–Industrial Magnetics Inc. (IMI) was recently commissioned to design a custom magnetic lifting system for stacking and de–stacking various sizes of steel plate, ranging from 0.5 inch to 2 inches thick, and up to 99 inches wide by 290 inches long. 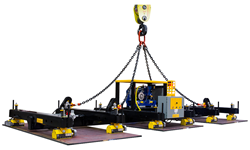 Its customer was looking to increase productivity while ensuring operator safety when handling large, heavy loads. Based on the application parameters, IMI's engineering department designed a system with a total lifting capacity of 19,200 pounds. It included 12 PowerliftTM permanent, on/off lift magnets that are controlled by pneumatic actuators. These permanent magnetic lifts were specifically chosen over electromagnets because they positively hold the load in the event of a power loss, while possessing the ability to be switched from an "on" to an "off" state, IMI said in a press release. As operator safety was a top priority, the custom lift system contains a 2 button, grip–proof–release operation; PLC controlled safety routines that ensure proper magnet grip before lifting; load sensors that lock out release functionality while the lifter is off the ground; automatic compressor control; and an indicating stack light. The custom magnetic lifter is also highly flexible. Depending on the needs of the application, it can accommodate a 4– , 8– , or 12–lift magnet configuration. The company (www.magnetics.com) recently published a video of the magnetic lift solution on its YouTube page at www.youtube.com/watch?v=kcILfQWi7p8.